These items were not commercially available and have become quite collectable and have sat in my dry loft out of direct sunlight and stored in dust prof bags. An Adventure 65 Million Years In The Making. 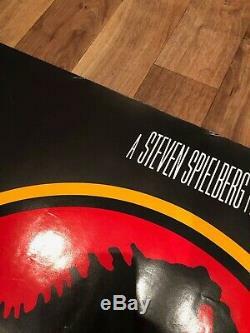 The blood red background silhouetting the infamous T-rex skeleton makes for the most iconic and instantly recognisable logo in cinema historyIt can only be Steven Spielbergs 1993 blockbuster Jurassic Park. 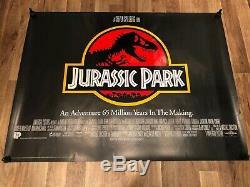 Ground breaking and game changing are phrases banded around far to easily in this day of modern cinema but Jurassic Park truly deserves these titles. A huge worldwide success on its release with merchandising and memorabilia hugely sought after with the British UK quad design being one of the most desirable film posters. 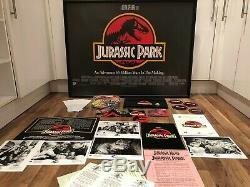 From first year of release 1993 NEVER folded original, unrestored UK quad movie poster displays and presents to excellent effect with deep black background and bright red logo. 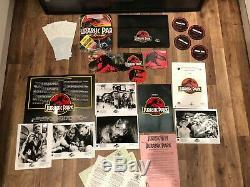 A fine piece of scarce original movie memorabilia from this groundbreaking film that kickstarted the CGI phenomenon and made millions fall in love with a T-Rex. 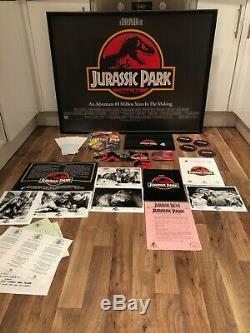 Not only is this listing for the Poster but it also includes some never seen before merchandise the CD was not the one for sale it was a prototype that was meant for display and to advertise the Premier release. 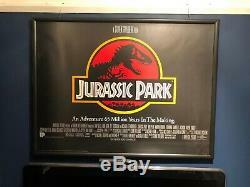 1 x Poster 30 x 40 Inch Framed Black Snap with U. 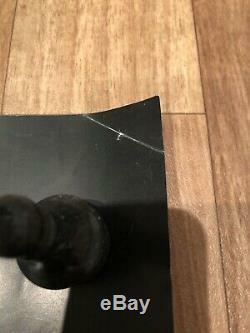 It has one tiny fold top right corner and some small crease along the top see photos its hardly anything at all. Some poster have had stickers attached or a circle on bottom right these are not the same and were made much later than this one. 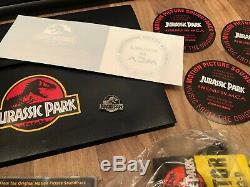 1 x Press Kit inc cast info etc (colour Logo with all cast details and the movie synopsis). 2 x folder with Logo (meant to keep the cast info together). 1 x Outer Folder with logo (these were limited to one per company and i believe only the larger ones got them). 1 x Emblem / Pin Badge (this was made to be given to audience of an advance screening). 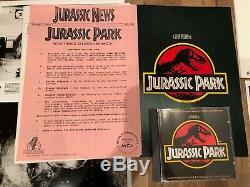 1 x CD with 16 tracks (if you read the pink flyer in the photos the movies made a soundtrack CD to sell to the public but the one included was not the final version it was meant for promotional purpose only). 4 x Stickers intended to be stuck to the poster (thankfully) they never was it would of been a shame to distort such a poster. 4 x Glass/Window Stickers with logo (intended to be stuck to the ticket booth). 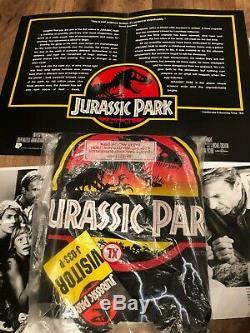 1 x XL Sealed T-shirt with Visitor Tag (extremely rare item again meant for the original screening never seen another). 1 x Information Pack to inform the Theatre what to do with the promotional items. 1x bunch of advertising leaflets. You will never see anything like this listing again t. Free P&P Signed and insured. Please message me for any more photos or details, and thank you for looking at my listing. 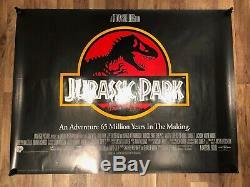 The item "GENUINE ORIGINAL JURASSIC PARK MOVIE POSTER UK QUAD 30 X 40 BUNDLE PRESS T-SHIRT" is in sale since Saturday, March 16, 2019. 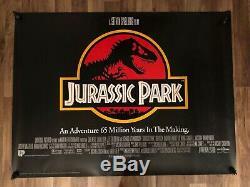 This item is in the category "DVDs, Films & TV\Film Memorabilia\Posters\Originals - UK Quads\1990s". The seller is "sunflower24a" and is located in Liverpool. This item can be shipped worldwide.